”Primal Shakti, I bow to Thee! ”I bow to the primal power. Adi Shakti mantra, also known as Adi Parashakti mantra, literally translates as the ”First Power”. As per Shaktism, Adi Parashakti appeared as Divine Pure Eternal Consciousness i.e. Shoonya Bindu, the divine zero feminine energy, which then expresses itself as Prakriti (Universal Nature). Every God in Hinduism has his Shakti and without Her sacred energy, they have no power. The play of female energy has no creation and no end. Although restless by nature, it cycles through periods of rest and motion. Not only is the Shakti responsible for the entire creation, it is also the agent of all change. Shakti is cosmic existence as well as liberation, its most important form being the Kundalini Shakti, a mysterious psychospiritual force. Adi Shakti means, literally, the primal, first power. This powerful mantra, meaning “churning of the mind,” works deeply on the subconscious and conscious mind to awaken reverence for all aspects of the Divine Feminine. ”Namo” literally translates as ”to bow in reverence”. RELATED POST What is the Meaning of Mul Mantra (Mul Mantar)? Mantra recitation is said to be the mother of meditation. Researchers have found that chanting mantras, either in a group or done solitary, has profound mental , physical, and emotional benefits. 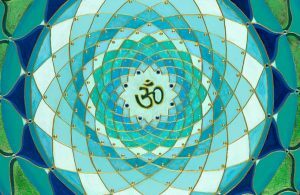 With the chanting of a sacred mantra, the mind promptly concentrates on a solitary thought expediting transcendence (consciousness past the mind). In addition, daily chanting of a mantra helps one to develop renunciation, which leads to moksha (liberation), which leads to self-realization or to God. Furthermore, reciting mantras can take us from low spirits to high, can be the instrument that helps us clear out gnarly, unhealthy, old, seemingly-impossible-to-bust-loose patterns and behaviors, or can simply be a way to experience joy and bliss by letting the voice flow freely. Kundalini is the spiritual energy coiled at the base of the spine where your root (Muladhara) chakra dwells. Kundalini mantras aid in the awakening of this spiritual energy and allow it to rise up the spine and open the higher chakras. The healing mantra tunes one into the frequency of the Divine Mother, and to the primal protective, generating energy. Also, it is said that chanting this mantra with a sincere heart fulfills desires and eliminates fears. When a man chants it, the goddesses will serve him. When a woman recites the mantra, the universal energy will serve her. Moreover, reciting this mantra brings humility and honoring of the greatness and virtue of the Divine Feminine within all. RELATED POST Ik Onkar (Ek Onkar) Satnam Karta Purakh – What is the Meaning of Mool Mantar? This meditation tunes the practitioner into the frequency of the Divine Mother. It is an amazing meditation for pregnant women to chant to their babies and for all women to connect to the Divine Feminine. Additionally, whenever this meditation is sincerely practiced, one will find that the security, prosperity, and abundance he or she needs quickly arrive in one’s outer and inner life experience of the Feminine Force. Sit in sukhasana (easy pose) with eyes closed, and the hands in gyan mudra, also known as Vaayu-Vardhak in traditional Ayurveda. Chant the mantra for 11-31 minutes. This entry was posted in Kundalini Mantras on August 29, 2016 by admin.